Founded in 2006, Riverwind Casino is a gaming property in Norman, OK owned by the Chickasaw Nation. Riverwind offers more than 2,800 electronic and table games across 219,000 square feet and features a hotel, several dining options and a theatre that hosts world-class entertainment year-round. Koch Communications’ challenge was to develop a plan to grow organic website traffic and increase search engine results page (SERP) rankings to contend with regional competitors, including entertainment venues and other casinos. Throughout the planning and execution of the process, Koch Comm encountered several challenges, including the increasing age of the website, dated site management practices and growing congestion of competitors. The structural and technical issues present with an older site also led to challenges that included decreased site speed and damaged overall SERP rankings in the ever-changing realm of search engine algorithms. To attack this challenge, Koch Comm developed a plan for regular audits to analyze historical website data including traffic, competitor research, page elements errors, issues and strengths, site speed and general page issues. These audits were scheduled to occur once per fiscal quarter, allowing the team time to analyze the data and develop strategies to further optimize the site through comprehensive link building and keyword strategies. In addition to the findings from the technical audits, integrated strategies followed which included updating meta data, optimizing for Google’s algorithm updates, custom 404 redirects, optimized landing pages and content creation including developing a consistent blog presence. Koch Comm worked to ensure expired promotions or entertainment landing page links redirected to related content and worked in tandem with the internal linking strategy. 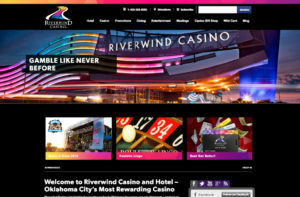 Additionally, the team considered audience data and popular pages on both the Riverwind site and competitor sites to create high ranking and useful blog content and website copy. Specific goals were set for this type of content to be added to the site monthly. After making technical changes and improving content on the site, Koch Comm focused on keyword maintenance. The team ensured the site was structurally and technically sound then focused on maintaining the growth that had occurred through the content strategy changes. This preparation provided Koch Comm the foundation and agility to optimize following any unforeseen Google algorithm changes that could arise. Since initiating the audit process, Riverwind has seen significant growth in organic site traffic, keywords and rankings. Riverwind’s organic site traffic has grown 32.65% since beginning efforts in April 2016. Although the strategy now focuses primarily on keyword maintenance, there is continued growth in organic site traffic. Additionally, as of the most recent audit, Koch Comm evaluated the top 50 ranked organic keywords from each of Riverwind’s top five competitors. Of those 250 total keywords, Riverwind ranked higher than their competitors in all but 12 non-branded keywords. Through this process, there has been a continued increase in competitors investing in paid search efforts, thereby increasing competition on SERPs. Because of the strong emphasis on SEO, Riverwind continues to rank well organically and competes for the audience’s attention. Even in situations where competitors are outbidding for paid search placement, Riverwind’s high organic rankings keep the brand top-of-mind and top-of-page.